Turn to your favorite poet or an anthology of poems. Read until you find a poem that illustrates the point that Yeats was making. What is it that makes the poem click? On our return to Colorado, we stopped in Silver City, New Mexico. The main drag is truly awful – a stringtown strip. But running parallel to the strip is a genuine historical district. A sign in front of Billy the Kid’s birthplace cabin points the way. 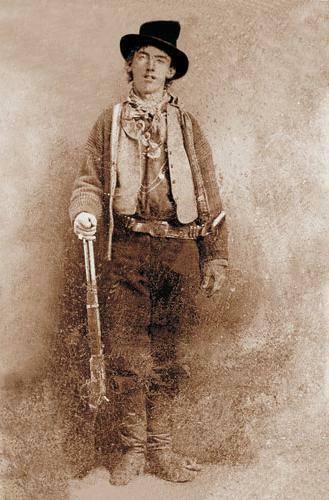 Dead at 21 years of age, killed by Pat Garrett in 1881, Billy was famous for killing 21 men. Was he thinking in terms of one killing per year, or was the number killed just a coincidence? Violence was especially prevalent in the 1880s. Prospectors led the way west and much to the chagrin of the Mexicans (whose land it was) and the Chiricahua Apaches (who claimed the land between the Gila and the Rio Grande rivers) the influx of whites led to increased conflict. The Chiricahuas were a migratory people. They followed the seasons, and when food was scarce, it was customary to raid neighboring tribes. Needless to say, the settlers (a neighboring tribe of sorts) did not take kindly to the raiding parties. Magas Coloradas was the tribal chief; Geronimo was one of his warriors, a medicine man attributed with special powers. In 1858, 400 Mexican soldiers from Sonora attacked the tribal’s camp. At the time, Geronimo was on a trading expedition, but on his return, he learned that his mother, wife, and his three children had been killed. He vowed revenge. Retaliation against the Mexicans was brutal. No bullets were able to stop Geronimo who fought only with a knife. Desperate for help, the Mexicans called out to St. Jerome. Legend has it that the name Geronimo was an outgrowth of the Mexicans pleading with “Jeronimo” for help. But one battle won is not a war. The Apache raids (or more charitably… the Apache fight to maintain their way of life) made them no friends. Geronimo became infamous. By 1876, 5,000 U.S. soldiers, 500 scouts, and 3,000 Mexican soldiers were trying to capture Geronimo and his followers. 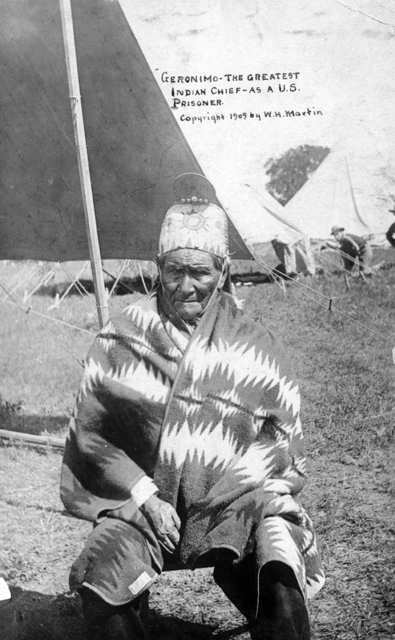 Geronimo escaped capture until 1886. At that point, Geronimo and his men were rounded up as Prisoners of War and shipped by train to Pensacola, Florida. The Apaches did not do well in the damp, humid climate. So the Army then sent them to Alabama… another damp and humid climate. Finally in 1894, those Apaches who had not died were sent to Fort Still, Oklahoma. 17 years would pass before the Apaches were released as Prisoners of War. Some stayed in Oklahoma. Those who wished to return to New Mexico were given land on the Mescalero Apache reservation. To the left, a photo of Geronimo as a U.S. prisoner, 1909. Manifest Destiny left a trail of tears.